One of TePe’s best-sellers, the TePe Interdental brush, has the following characteristics: - Ergonomic handle offers comfortable grip and good cleaning control. - Plastic coated wire to make sure the stem does not scratch tooth surfaces or implant posts. - Brush and handle in one piece. - 6 color-coded sizes make identification easy. - Handle and packet are made of environmentally-friendly polypropylene plastic. 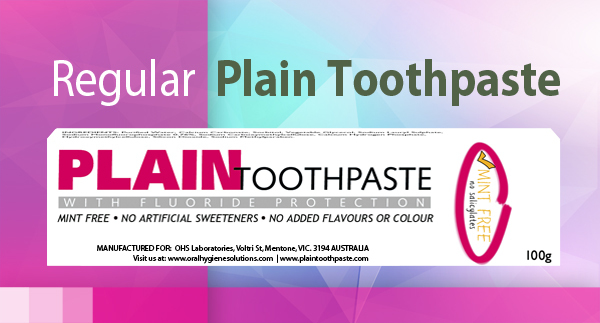 It is best not to use toothpaste unless advised to do so by a dental professional. Too much toothpaste makes the special filaments less effective. Use the interdental brush once a day. Change brush when it is getting worn. 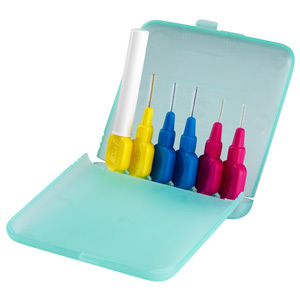 The Tepe Interdental Brushes (Travel Pack) consists of: - 6 Tepe Interdental brushes (assorted sizes) - Tepe travel case - 1 Tepe interdental brush lid which also acts as an extender to reach back teeth.